Quite often, we all run into this scenario where we need to convert column data into row with either comma or some other delimiter. This method gives us result in comma delimited fashion, but it only works for one parent at a time; And we cannot combine Parent name as a column next to Children column, as Sql Server does not allow combining data-retrieval with variable manipulation query. XML PATH gives us more control over retrieval manipulation. It allows us to retrieve data in a tabular fashion, while keeping the children names into one column. This is the most important part of this whole query. It allows us to retrieve all children of a given parent in a comma delimited fashion. Without FOR XML PATH(”) statement, this is just a query that returns children as rows. When you add FOR XML, that data set is now converted into XML format (sort of). PATH (”) makes sure that the the element trees notation is replaced with whatever is in between ” (empty). So we get a simple comma delimited child list. Now we have an extra comma to remove. That’s where STUFF comes into play. STUFF query section replaces comma with empty space. Main wrap-around query is to bring this all together with ParentID & Parent Name to make it more usable. XML DML is interesting feature of Sql Server. It is vast and has lots of features in manipulating XML files and its elements & attributes. Today, we’ll look at exists function to check if a particular element exists or an element with a specific attribute exists. Sql Server SQL XML DML: How to INSERT a new node or update value in non-existing node. Continuing the series of posts on XML DML, today, we’ll look at updating/replacing value in an non-existing node (or INSERTing a new node into an existing element). In the past two posts, we saw how to update (or replace ) values in XML nodes. The first one is about updating value in a simple untyped XML updates. Third one is about updating value in an empty node. Today, we’ll see how to update a non-existing node or INSERTing a new node into an existing element. Lets try to update the section in red in the image above. As it is obvious by now, that updating value of an non-existing node in an element is same as INSERTing a new node. The reason, non-existing aspect is highlighted is because, this XML example has multiple <ParentElement> elements, that have similar structure. Second element only has data in first node; Second child node is empty. Third element also only has data in first node; Second child node does not exist. Continuing the series of posts on XML DML, today, we’ll look at updating/replacing value in an empty node. Update (or replace) element attribute value in a typed XML. Today, we’ll see how to update when the node is empty. Let’s see some code to create sample table with XML column with an XML record. Lets try to update the section in green in the image above. When a node is empty, XML DML works differently. We cannot use one of the methods mentioned in previous posts (here & here). 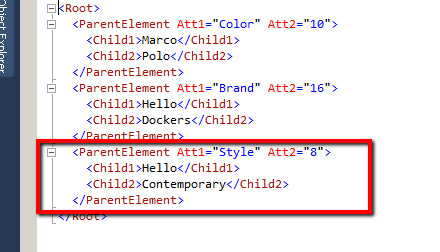 For XML DML the node (‘/Root/ParentElement[@Att1=”Brand”]/Child2/text())‘) does not exist. So, when we try to look it up, nothing comes back to be updated. The frustrating part is the message that says “(1 row(s) affected)“, when nothing got updated. So after some head banging on desk exercise, this came up.